Ponant is testing a revolutionary sail using fibreglass, carbon and epoxy-resin panels in a carbon-slat frame, which may provide a vital key to reducing the environmental impact of cruising. Ponant, the only French-flagged ocean cruise line and a renowned leader in luxury expeditions, has joined forces on the project with maritime construction company Chantiers de l’Atlantique. 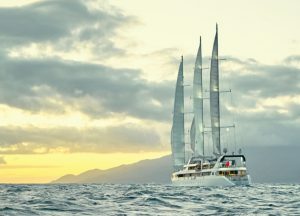 A few weeks ago, Ponant began testing the revolutionary Solid Sail concept, introduced two years ago by Chantiers de l’Atlantique as part of the sailing cruise-vessel project Silenseas. Two patents have been filed – in 2009 and 2017 – for the new type of sail, made of fibreglass, carbon and epoxy-resin panels in a carbon-slat frame. The new technology is said to slash energy consumption tied to propulsion, thus considerably reducing environmental impact. In October 2018, solid sails of over 300 square metres were installed on Le Ponant during a technical stop in Marseille, France. 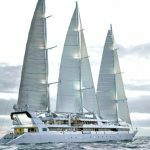 As the three-masted ship sets sail for Cape Verde before embarking on a transatlantic voyage to Cuba, the 50%-scale prototype will be tested for a year on the company’s sailing vessel. “When Chantiers de l’Atlantique offered to collaborate with us on solid-sail technology, we were immediately interested,” said Ponant chief executive Jean-Emmanuel Sauvée. Head of Chantiers de l’Atlantique, Laurent Castaing, is confident that the Solid Sail propulsion system can provide a solution for future passenger vessels, “allowing for significant operational gains both environmentally and economically”. Castaing said the company has already carried out tests with a smaller version of the sail. “Today it involves the largest Solid Sail systems ever tested, and we considered Ponant the partner of choice for these tests,” he said.